piLLai uRangA villi dhAsar was a great wrestler in the king’s court and was living in uRaiyUr along with his wife named ponnAchiyAr. He was very attached to his wife due to her extreme beauty (specifically her very beautiful eyes). He is originally known as dhanurdhAsa. He was very wealthy and had great respect in the kingdom due to his bravery. Once when srI rAmAnuja was walking along with his sishyas, he noticed dhAsar walking in front of ponnAchi holding up an umbrella in his one hand protecting her from the sun and holding a cloth on the ground to comfort her feet while walking. emperumAnAr was astonished to see dhAsar’s attachment towards this woman and called him over. emperumAnAr asks him why dhAsar is serving that woman like that. dhAsar replies that her eyes are so beautiful and he is completely surrendered to her beauty and will do anything to protect her beauty. emperumAnAr being the most intelligent, immediately asks dhAsar, if he is shown something more beautiful than his wife’s eyes if we will be surrendered to that. dhAsar at once agrees that he will surrender to that most beautiful entity. emperumAnAr takes him to srI ranganAthan and asks emperumAn to show dhAsar the same beautiful eyes that was shown to thiruppANAzhwAr. emperumAn naturally manifests the most beautiful eyes and dhAsar at once realises that he has found the real beauty. He immediately surrenders to emperumAnAr and requests him to accept him as his sishya. His wife too understanding the greatness of emperumAn and emperumAnAr, immediately becomes surrenders to emperumAnAr and asks for guidance. The couple together give up all their attachments and comes to srIrangam to stay and serve the lotus feet of emperumAnAr and emperumAn. emperumAn blesses dhAsar fully, and due to him constantly worshipping emperumAn like lakshmaNan who never slept during srI rAman’s vanavAsam, he became to be famously known as piLLai uRangA villi dhAsar. dhAsar and ponnAchiyAr become extremely attached to emperumAnAr. They simply spend their life by serving emperumAnAr and emperumAn. Once during namperumAL’s thIrthavAri (final day of uthsavam), emperumAnAr while climbing up from the temple tank, holds the hands of dhAsar. Some sishyas think that it is not appropriate for emperumAnAr who is a sannyAsi to hold the hands of dhAsar (because of his varNam). They reveal their mind to emperumAnAr and emperumAnAr establishes dhAsar and ponnAchiyAr’s glories through a beautiful incident. emperumAnAr asks them to go to dhAsar’s house and steal whatever jewels possible from there. They go to dhAsar’s house where ponnAchiyAr was lying down. They quietly go near her and try to remove the jewels from her. ponnAchiyAr realising that these srIvaishnavas are trying to steal and thinking that they may be doing it due to their poverty, she allows them to remove the jewels easily. Once they are done with one side, she pretends to naturally turn around to allow them to remove the jewels from the other side of her. But they become alert and afraid and run away from the place and return to emperumAnAr. After hearing the incidents, emperumAnAr asks them to go back to dhAsar’s house and ask them to observe what happens. When they return, they see that dhAsar is back and he is talking to ponnAchiyAr. He is asking her why the jewels from one side are missing. She replies to him saying that some srivasihnavas came to steal them and she allowed them to take the jewels from one side and once they were done with that side, she turned around to facilitate them. At that time, dhAsar becomes very upset and tells ponnAchiyAr that she should have stayed like a stone to let them take the jewels in whichever way and by turning around she scared them. They both were so great that they were even trying to help the ones who were trying to steal from them. 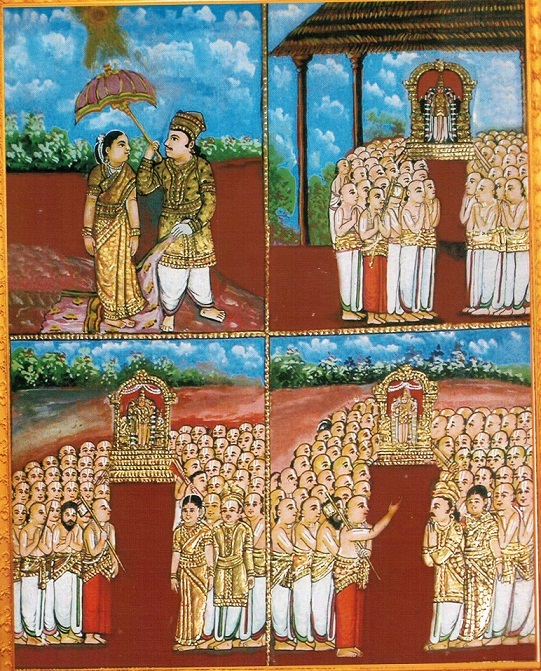 The srivaishnavas return to emperumAnAr and explain the incidents to him and accept the greatness of the great couple. The next morning emperumAnAr explains the incidents to dhAsar and returns his jewels back to him. dhAsar is glorified as mahAmathi (great intellectual) due to him being extremely attached to emperumAn like srI vidhurar and periyAzhwAr. ponnAchiyAr’s nirvAhams (conclusions) are also highlighted in a few incidents in pUrvAchArya works showing that she was greatly knowledgable in sAsthram. Many idhihyams related to dhAsar and his wife are explained in our pUrvAchArya works. Let us see some of them now. 6000 padi guruparamparA prabhAvam – Once emperumAnAr was lecturing on vibhIshaNa sharaNAgathi. dhAsar stands up from the gOshti and asks “if srI rAman is debating along with sugrIva, jAmbhavAn, etc for so long to accept vibhIshaNa who has given up everything, how will I (who is still attached to family, etc) get mOksham?”. emperumAnAr replies “If I get mOksham, you will get too; if periya nambi gets mOksham, I will get too; If ALavandhAr gets mOksham, periya nambi will get too; thus it goes on up the chain in the paramparai; since nammAzhwAr declares he got mOksham and since periya pirAttiyAr is recommending to emperumAn for us we will all get mOksham. Ones who have bhAgavatha sEshathvam are sure to be redeemed – just like the 4 rAkshasas who came with vibhIshaNan were automatically redeemed by srI rAman because of their dependence on vibhIshaNan”. periya thirumozhi 2.6.1 – periyavAchAn piLLai vyAkyAnam – dhAsar’s extreme attachment towards emperumAn (like yasOdhai, periyAzhwAr, etc) is shown here. During puRappAdu (procession) of namperumAL (srI ranganAthan), dhAsar usually walks in front of namperumAL watching emperumAn carefully and having his hands on his sword. If there is even a slight jerk or disturbance to namperumAL, he will kill himself with the sword (since he did not kill himself, we can understand that they were carrying namperumAL with great care). Because of this attachment, dhAsar is called mahAmathi. Intelligence means worrying about the well-being of emperumAn. thiruviruththam 99 – nampiLLai vyAkyAnam – Whenever kUrathAzhwAn starts explaining thiruvAimozhi, dhAsar will become very emotional and start enjoying about krishNa charithram. AzhwAn looking at that glorifies dhAsar very much. He says “Unlike us who can learn bhagavath vishayam and try to explain that to others – you just melt away thinking about bhagavAn – your nature is so glorious”. AzhwAn himself usually melts thinking about emperumAn – if he is saying like this about dhAsar we can understand how great dhAsar is. thiruviruththam 9 – nampiLLai svApadhEsam – Once emperumAnAr wanted to leave from srIrangam and go to thirumalai. At that time he sends a srIvaishNava to the stores (which is controlled by dhAsar) to get some rice. At that time, since dhAsar comes to know about emperumAnAr’s plan to leave srIrangam, he was crying very much inside the store room out of sorrow. This shows his great attachment towards emperumAnAr. The srIvaishnava returns to emperumAnAr and explains the incident to him and emperumAnAr understands the mood of dhAsar and he also says that he cannot bear the separation from dhAsar. thiruvAimozhi 4.6.6 – nampiLLai vyAkyAnam – Once dhAsar’s 2 nephews (named vaNdar and choNdar) were walking with a king and the king shows a jain temple and tells them that it is a vishNu temple and asks them to offer their respects. Seeing the similarity in architecture, they immediately do that, but the king then tells them that he was just teasing them. But vaNdar and choNdar immediately loses their consciousness realising that they have worshipped some one other than srIman nArAyaNan. dhAsar hears this incident and runs to them and applies the dust of his lotus feet and they immediately regain their consciousness. This shows that the dust of the lotus feet of bhAgavathas is the only cure for any dhEvathAnthara bhajanam (even when done unknowingly). thiruvAimozhi 1.5.11 – nampiLLai vyAkyAnam – For “pAlEy thamizhar isai kArar paththar”, AzhwAn once said “srI parAngusa nambi is pAlEy thamizhar (great expert in thamizh), AzhwAr thiruvaranga perumAL arayar is isai kArar (musician) and piLLai uRangA villi dhAsar is paththar (bhakthar – great devotee)”. There are many incidents which highlight the attachment of dhAsar towards kaNNan emperumAn. thiruviruththam 95 – periyavAchAn piLLai vyAkyAnam – Once a cowherd boy steals the milk which was going for the king and the soldiers were beating him. Looking at that, dhAsar considered that cowherd as krishNan himself, goes to the soldiers and tells them that he will accept whatever punishment and asks them to release the cowherd. nAchiyAr thirumozhi 3.9 – periyavAchAn piLLai vyAkyAnam – dhAsar says that “Since krishNan is very young, he cannot protect himself. His parents are also soft natured and cannot protect him since they themselves are jailed. kamsan and his associates are waiting to constantly kill him. It is only the dark night (during which krishNan was born) that protected him. So, let us glorify the dark night which protected emperumAn”. periyAzhwAr thirumozhi 2.9.2 – thiruvAimozhi piLLai vyAkyAnam – dhAsar hearing about gOpis complaints to yasOdhai on krishNan stealing their butter, argues in support of krishNan as follows. “Did he break any lock? Did he steal any jewels/gems? Why are the complaining about krishNan? He himself has so many cows at home which needs to be milked and there is plenty of butter at his home itself. Why would he steal from some other place? May be he just entered some one’s house thinking that it is his own house. Why do they keep saying he stole butter, milk, etc?”. ponnAchiyAr is also considered equally knowledgable and is shown in many incidents. In charamOpAya nirNayam, emperumAnAr, knowing ponnAchiyAr’s advanced intellect, establishes his own glories through her. Please read the full incident at http://ponnadi.blogspot.com/2012/12/charamopaya-nirnayam-ramanujar-our-saviour-2.html. piLLai lOkAchAryar also glorifies piLLai uRangAvillidhAsar while explaining mangaLAsAsanam (praying for the well-being) of emperumAn in his magnum opus srI vachana bhUshaNam. After some time, dhAsar during his final days invites all srIvaishNavas to his thirumALigaai, performs thadhIyArAdhanam, accepts their srIpAdha thIrtham, tells ponnAchiyAr that he is leaving to paramapadham and she should continue to live. Keeping emperumAnAr‘s pAdhukas on his head, he gives up his charama thirumEni. srIvaishNavas arrange for his final journey, bring the holy water from cauvery river, performs srIchUrNa paripAlanam (applying puNdrams), etc., to him. ponnAchiyAr understanding the great benediction that is awaiting dhAsar in paramapadham, happily decorates the place and takes care of the srIvaishNavas during the whole time. Finally, after dhAsar’s thirumEni is carried on a palanquin and reaches the end of the street, she starts crying loudly unable to bear the separation from dhAsar and at once gives up her life as well. All srIvaishNavas become astonished at her and at once arrange for her to be placed along with dhAsar as well. This shows the extreme level of attachment towards bhAgavathas where they cannot bear the separation of bhAgavathas even for a small moment. maNavALa mAmunigaL while compiling the iyal sARRumurai (recited at the end of iyaRpA during uthsavam times) based on various AchAryas pAsurams. The first pAsuram was written by piLLai uRangA villi dhAsar and has the essence of our sampradhAyam. We declare that have no worries and have the real wealth (of kainkaryam) because we are surrendered to the srIvaishNavas who are surrendered to srI rAmAnuja who himself is surrendered to kaNNan emperumAn the one who lifted the gOvardhana hill to protect his dear devotees (gOpas and gOpis). Time and again, our pUrvAchAryas have shown that a srIvaishNava’s greatness is not because of his birth in a particular varNam, but only because of his devotion towards emperumAn and other srIvaishNavas. piLLai uRangA villi dhAsar’s life and our AchAryas’ glorification of dhAsar is a clear indication of the mood and attitude of our AchAryas on this particular principle. Thus, we have seen some glimpses of the glorious life of piLLai uRangA villi dhAsar and ponnAchiyAr. Both of them were fully situated in bhAgavatha nishtai and were very dear to emperumAnAr himself. Let us pray at their lotus feet that we too get a little bit of such bhAgavatha nishtai. This entry was posted in other AchAryas and tagged lokachariar nayanar koora kulothama dasar on February 22, 2013 by sarathyt.